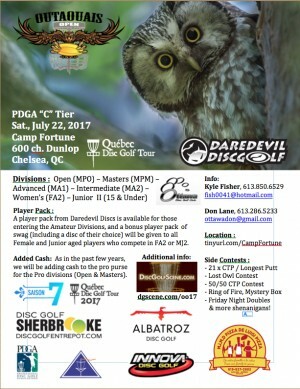 The 5th edition of the Outaouais Open is an annual tournament that is a part of the Quebec Disc Golf Tour (QDGT), and is held at the challenging mountain course at Camp Fortune in Chelsea, Quebec. The winner of the Open division is awarded Â«The Dome CupÂ». The tournament features a combination of at least 18 CTPs or Longest Putt prizes (3 for every division and 2 additional CTPs and a Longest Putt for All Divisions). The winners in all divisions that feature at least 4 participants will each receive a tournament logo Bluetooth speaker. We offer lots of side contests, additional bonus prizes and a ton of fun! 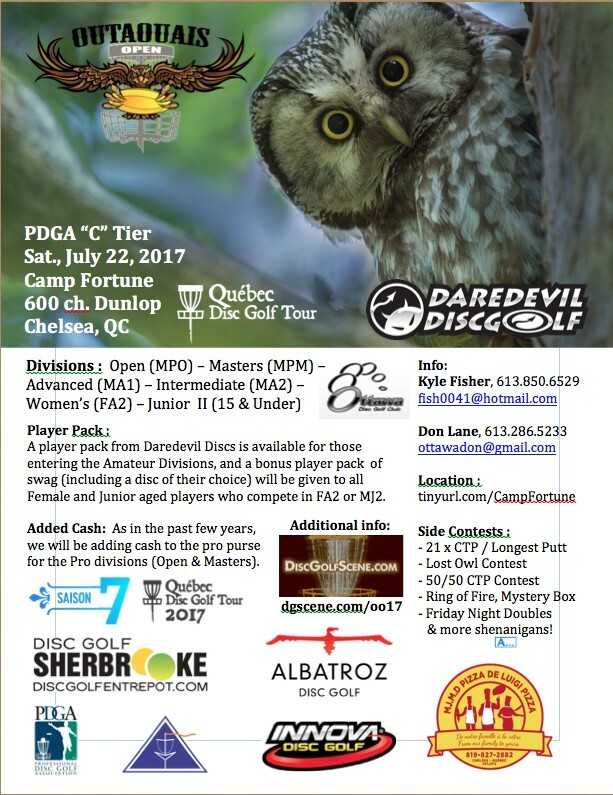 The event features regular PDGA payouts and added cash for the two pro divisions (Open/MPO & Masters/MPM). This year our event is sanctioned as a PDGA "C" Tier in all divisions. Winners of all divisions will receive QDGT Victory Patches, and we have Ace Patches for anyone who hits an ace at our tournament. Please add $10 to your entry fee if you are not a current member of the PDGA (except for the Junior Division). All players entered into the amateur divisions will get a Player Pack disc with the tournament logo. All women and juniors entering the tournament in their respective divisions will get an additional player pack which includes a great new disc of their choice from a wide assortment donated by the TDs, along with a swag bag of useful things. Side events featured will be several Â«Ring of FireÂ» rounds (for people who have not otherwise won a prize at the tournament), a CTP contest, and a special Mystery Box will be available for a random draw, with tickets selling for $2 each or 3 for $5. All $ proceeds will be added to the payout for the pro divisions. An evening round of Random Draw Doubles will be offered on Friday evening starting at 6:00 pm for those wanting to get a taste of the course layout. The entry fee for this Friday evening round is $8 with half of that going to the winning team, and the other half to the payout purse for the pro divisions.